It is stating that a galaxy is moving proportionate to its size. Since it says that it means that one day a long time ago it had to have started all together. The Big Bang theory suggests that the galaxy was initially EXTREMLY HOT. We should be able to find evidence of this and we did. It was found in 1965 by Arno Penzias and Robert Wilson. The evidence that was found by those two wise men was Cosmic Microwave Background radiation. This is Arno Penzias and Robert Wilson. 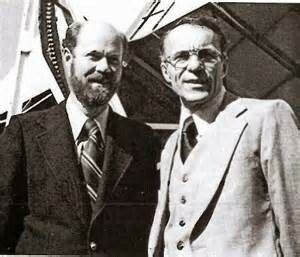 They won the Noble Prize for physics in 1978.